The Conservation Studio at PHM has been specially designed for the conservation of large textiles, those in our own collection, and those in the collections of other institutions and individuals by private commission. We are also supported by a wealth of skills and experience in conservation of all kinds and we are often host to students and volunteers wanting to learn with us. 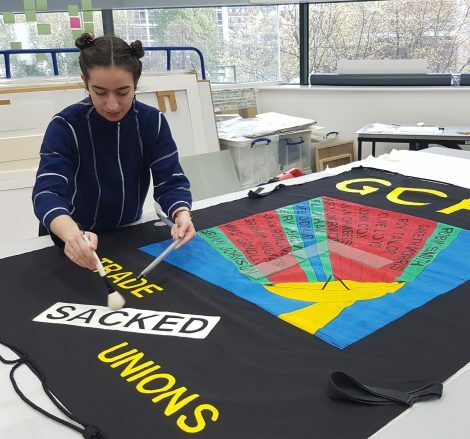 The Conservation Studio (TCS) was established in 1990 at our Princess Street site in Manchester to conserve the museum’s extensive collection of banners, provide a source of help and advice for custodians of textiles, and undertake private commissions. A new conservation lab was built as part of the museum’s redevelopment project in 2010. Visitors to the museum can see behind the scenes into the studio through a viewing area in Main Gallery Two. To enquire about tours and future events, please contact the Learning Team. The Studio offers facilities including solvent extraction, wet cleaning floor, flexible work tables, separate dye lab and Studio hoist for photographing and checking textiles after treatment. We also have a mechanical hoist which allows us to safely transport rolled textiles up to 4.8 meters long in and out of the building. The Studio is environmentally controlled as is the secure object store which is housed within the Studio space. 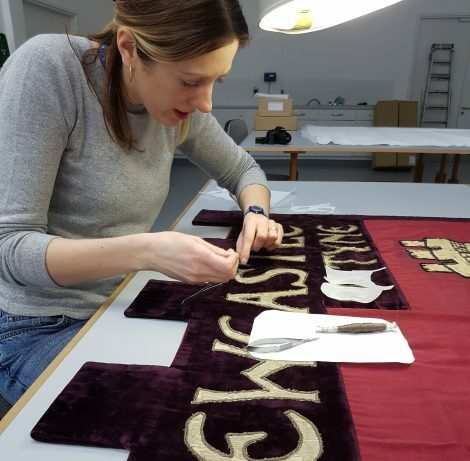 Jenny is our Conservation Manager, she is a trained and accredited Textiles Conservator and an expert in her field, she has an extensive knowledge of social history textiles across the UK and an in depth knowledge of banner use and manufacture. She is responsible for the management of the studio and arranging external commissions with clients for income generation for the museum. Kloe is our Objects Conservator, she is trained in the conservation of all object types and is specialising in the conservation of large textiles. She works closely with the Programming team, helping to develop and deliver temporary exhibitions, loans and maintain the permanent galleries.